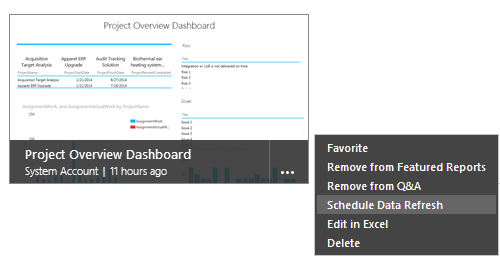 With the new availability of Power BI for Office 365, Project users now have the ability to schedule workbook refreshes. For example, set it to update the data early in the day, so that your team can see fresh data instantly. 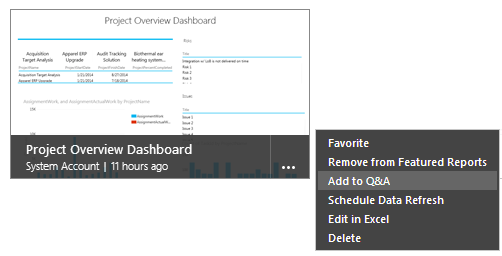 Among the other project management features introduced by Power BI, you will also find the ability to add your workbook to the self-service Q&A to allow querying your data results using natural language. You can add Power BI for Office 365 to your existing Office 365 subscription, or sign up for a standalone subscription to try it out. To get started, go to your Office 365 admin portal, and in the left column, click Purchase Services, then select the Power BI for Office 365 trial. Et voila, the simplicity of adding a feature to Office 365 at work. With Power BI for Office 365, you get 25 licenses that you can distribute among your users. To assign licenses, go to your Office 365 portal and on the left column, click Users and groups. Select the user to whom you want to grant Power BI access, and then click the Microsoft Power BI checkboxes. Additionally, select the SharePoint Online Plan 2 license if you did not already grant it to that user via another SKU. In order to use the full power of Power BI, remember to use Power BI Sites on Power BI for Office 365. (You can find the Power BI app on the Site Contents page.) Fire up Power BI sites, and now you have a great way to find and share workbooks, as well as easy access to all the capabilities in Power BI for Office 365. Learn more details here. Scheduled data refresh. That’s right, you can have your online workbooks refreshed while you sleep and the reports ready to be consumed by employees as they arrive at the office. No need to wait for the data to refresh anymore. 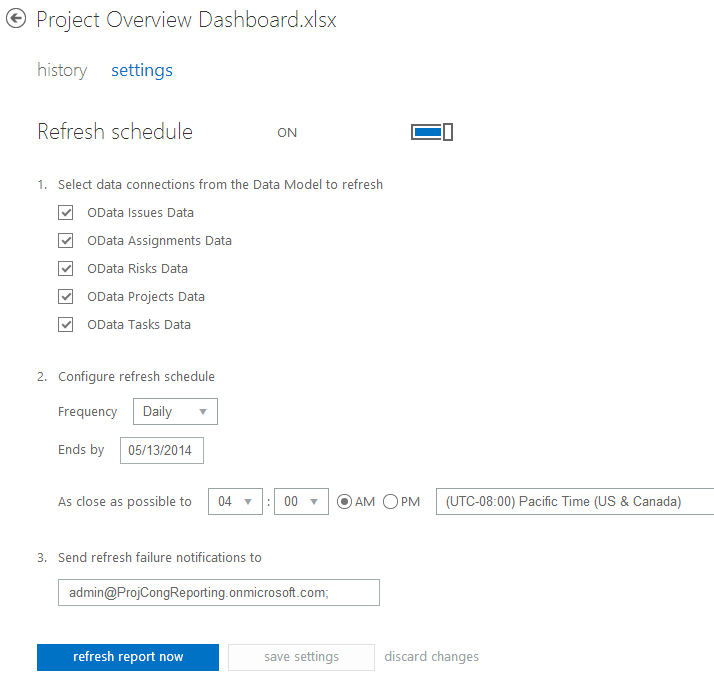 You can configure a data refresh schedule for an Excel 2013 workbook that has a Data Model uploaded to BI Sites. A workbook must have at least one data connection in the Data Model, and not exceed 250MB in size. In addition, a workbook must conform to the list of supported features in the web browser. For more information about the Data Model in Excel, see Create a Data Model in Excel. Learn more details about scheduled data refresh on Yitzhak Kesselman’s Power BI blog and on the Scheduled Refresh FAQ page. Larger workbooks. Use Excel Online in Power BI for Office 365 to view, edit and interact with Excel Workbooks up to 250MB in file size. Note that when a workbook exceeds 30 MB in file size, it must be enabled in order to display in a browser window with Excel Online. More information on file size limits in SharePoint Online with Power BI for Office 365 can be found here. Ask questions of your data in natural language. With the Q&A features, people can type questions they have of the data in natural language and the system will interpret the question and present answers in the form of interactive visualizations. After enabling your reports for Q&A integration, click the Q&A search link on the top right. Now you can use natural language to create your own search queries, and the system will always repeat what you wrote in a simple sentence that can help you make sure you are doing the right search and learning the correct syntax. Your best searches can be saved as Featured Questions and available for everyone to use. Create your graphs interactively with a few words. Stay connected with mobile access to your reports. With the new HTML5 support and the Power BI Windows app, you can stay connected from anywhere with new HTML5 support and the Power BI Windows app. 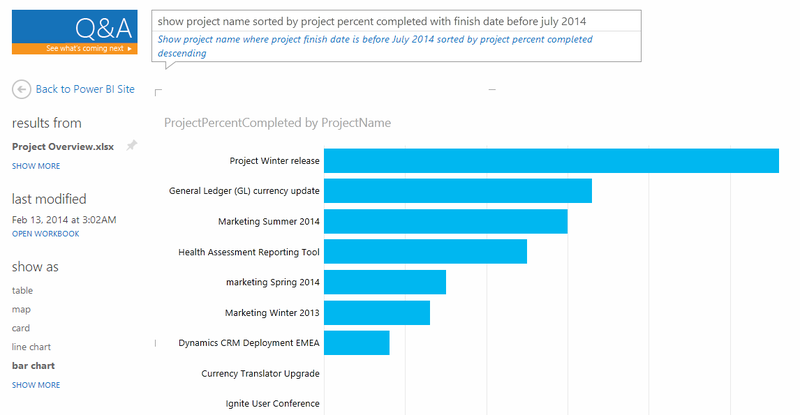 There are even more things to discover with the new Power BI offering. To learn more, go to PowerBI.com and try it for free on Office 365.